Found at very low levels (less than 2000 meters, or 6500 feet), stratus clouds are thick, large, heavy-looking gray clouds that dominate the sky. Precipitation normally does not occur with this cloud, although drizzle or mist may be observed. This type of cloud resembles fog, and occasionally when fog lifts, it will form a stratus cloud deck. 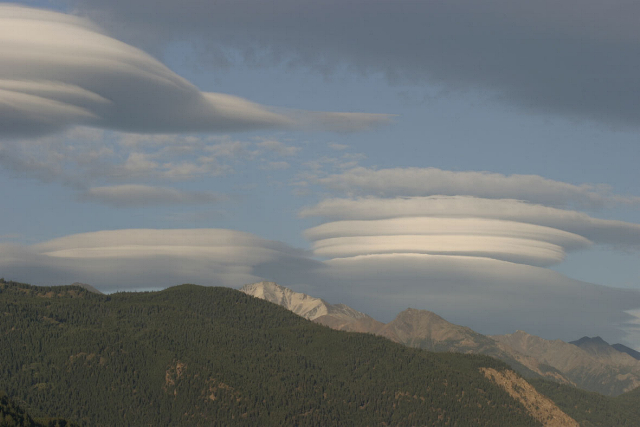 Latin Derivative: stratus - "layer"
Nimbostratus clouds are also found below 2000 meters. They are usually a darker color of gray than stratus clouds because of their high moisture content - precipitation usually occurs with this cloud type. The base of this cloud can be difficult to identify and it may stretch high into the atmosphere. Latin Derivatives: nimbus - "violent rain" and stratus - "layer"
The last variation on stratus clouds is the stratocumulus cloud. 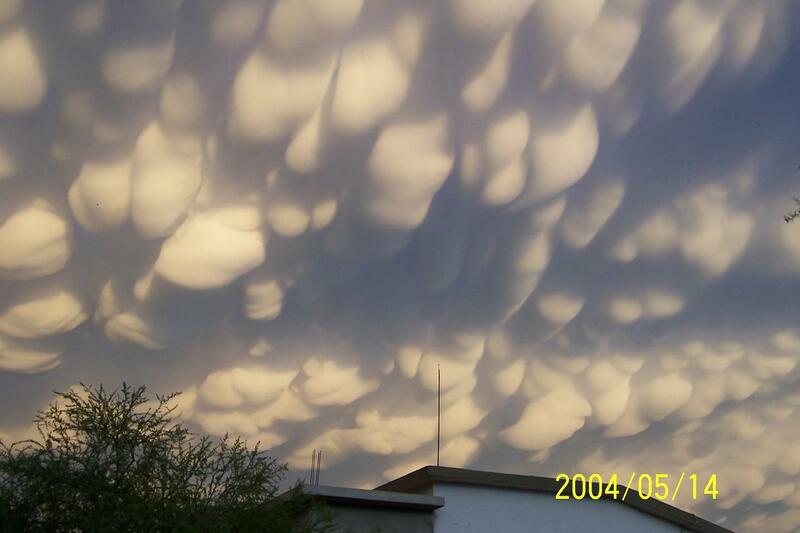 Occurring below 2000 meters, these clouds resemble little rows of cotton balls. 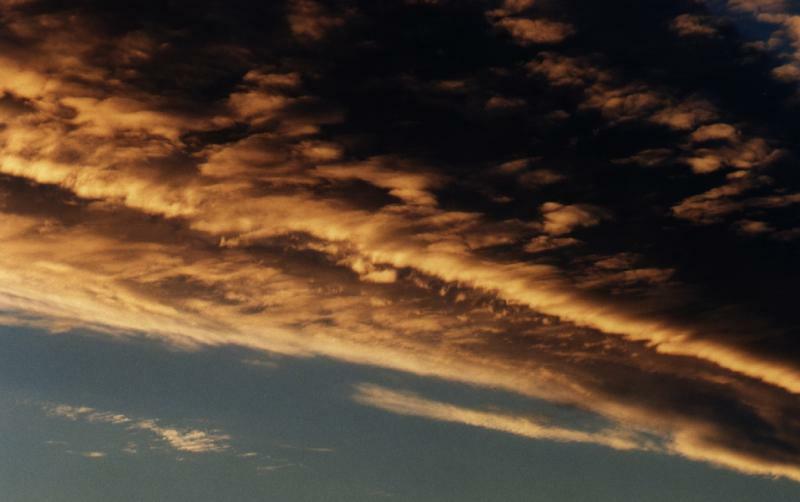 The coloring of these clouds can vary from gray to white depending on the sunlight angle. 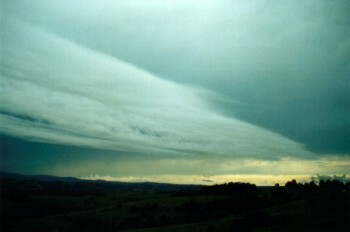 Precipitation is rare from this cloud; however, in the winter, if the top cools enough, some showers may occur as the clouds develop vertically. 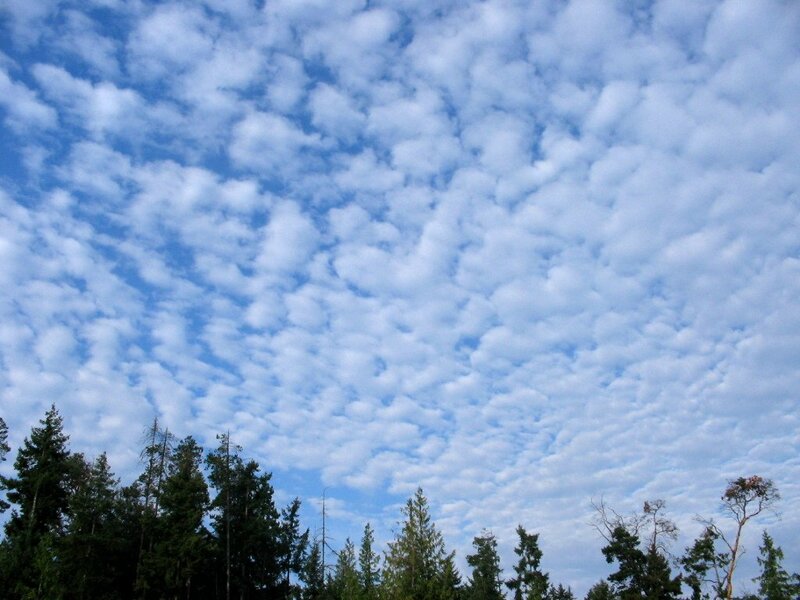 Latin Derivatives: stratus - "layer" and cumulus - "heap"
The altocumulus cloud has a base that begins between 2000 and 7000 m (6500 to 23,000 ft). These clouds are not to be confused with the altostratus type as these clouds appear bumpy. They may also be confused with stratocumulus clouds; however, these are larger. Because these clouds also have a high moisture content but tend not to precipitate, they often appear on very humid mornings where thunderstorms are expected by afternoon. Latin Derivatives: altus - "high" and cumulus - "heap"
The base of an altostratus cloud is found within the same levels as the altocumulus cloud. These clouds are much larger in size as they may stretch for miles, similar to stratus clouds. They are comprised of ice crystals and water droplets. 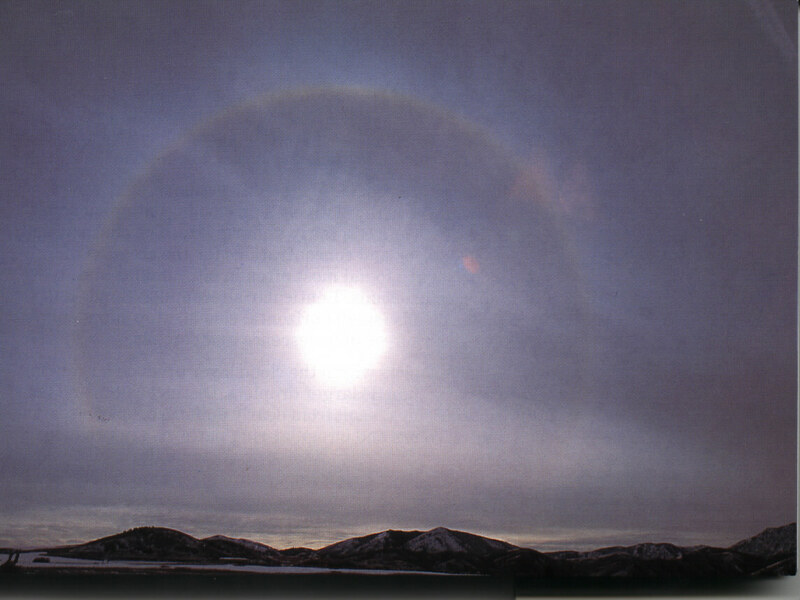 In thinner altostratus clouds, the sun may be dimly visible, commonly referred to as a "watery sun". 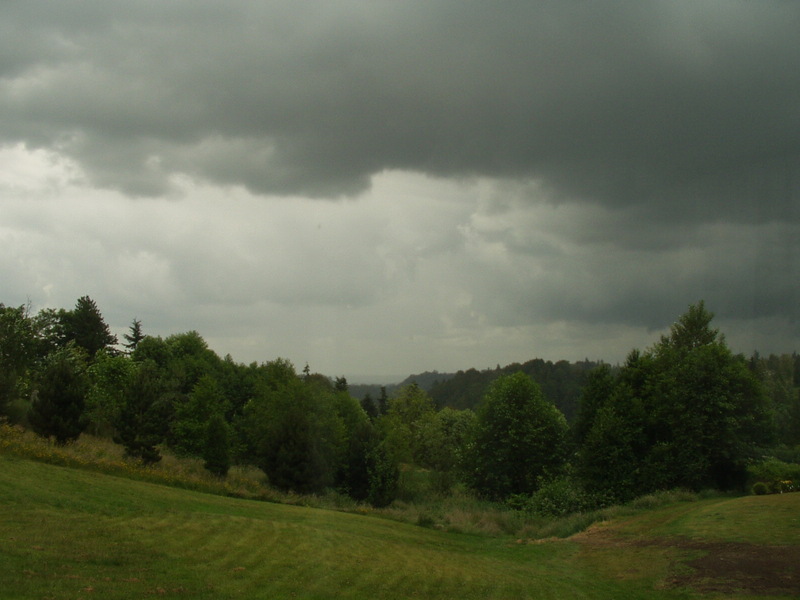 If this cloud begins to precipitate, the base usually lowers, classifying it as a nimbostratus. Latin Derivatives: altus - "high" and stratus - "layer"
Cirrus clouds are composed mainly of ice crystals due to their height in the atmosphere (6000 m, 20,000 ft and above). The dryness of the air higher in the atmosphere contributes to their thin, wispy look. These clouds generally occur with fair weather and are the ones usually responsible for those beautiful midwestern sunsets. They usually indicate the direction of the winds at their elevation. 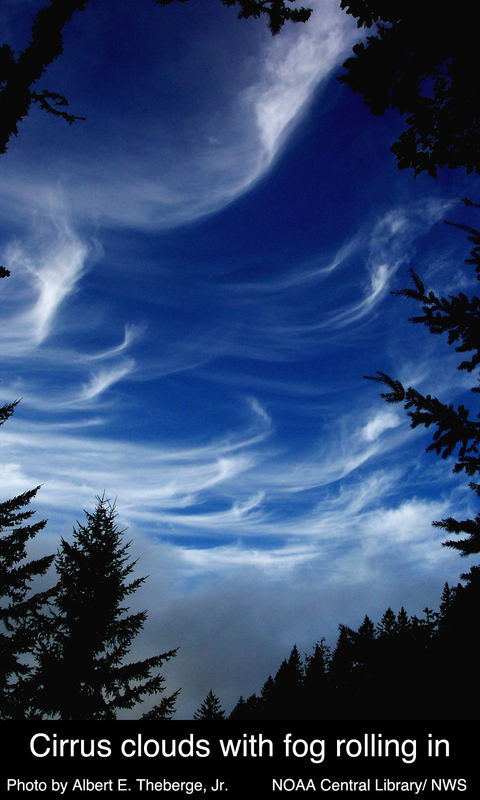 The "tails" demonstrated in the photo at the left are commonly called "mares' tails". These clouds are also responsible for Wichita meteorologist Dave Freeman's favorite phrase: "Nothing serious, just a little cirrus!" 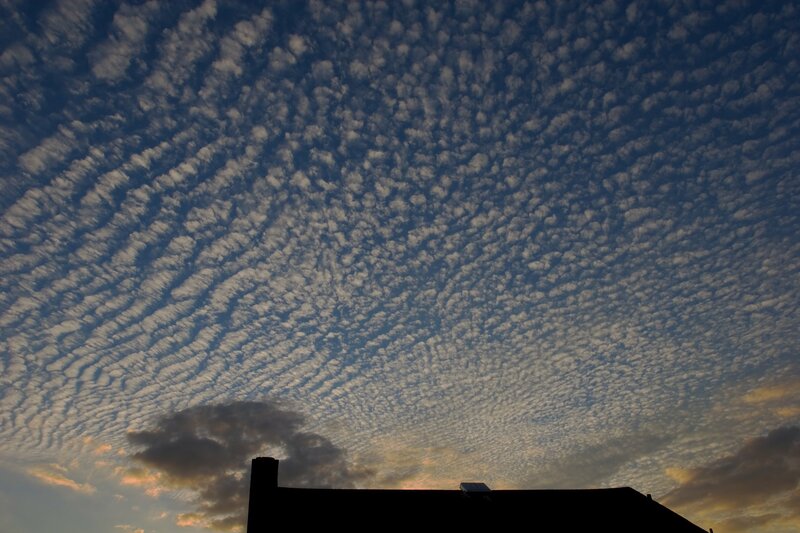 Latin Derivative: cirrus - "curl of hair"
Cirrocumulus clouds are found in the same high levels as cirrus. They appear almost like ripples over a small portion of the sky. 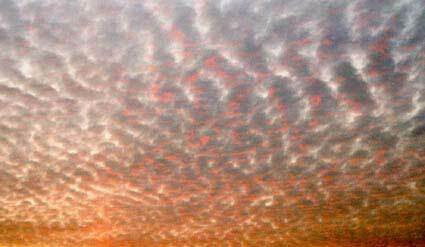 The term "mackerel sky" is often used to describe these clouds because of their likeness to fish scales. The suffix "cumulus" is given to them because of their lumpy appearance. Latin Derivatives: cirrus - "curl of hair" and cumulus - "heap"
Latin Derivatives: cirrus - "curl of hair" and stratus - "layer"
Cumulus clouds are the lovely, puffy ones that are good for finding shapes in. 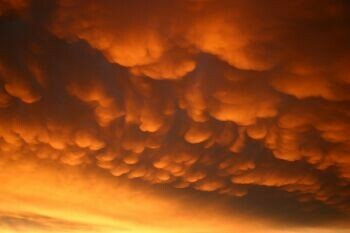 These clouds occur in many varieties of atmospheric conditions. 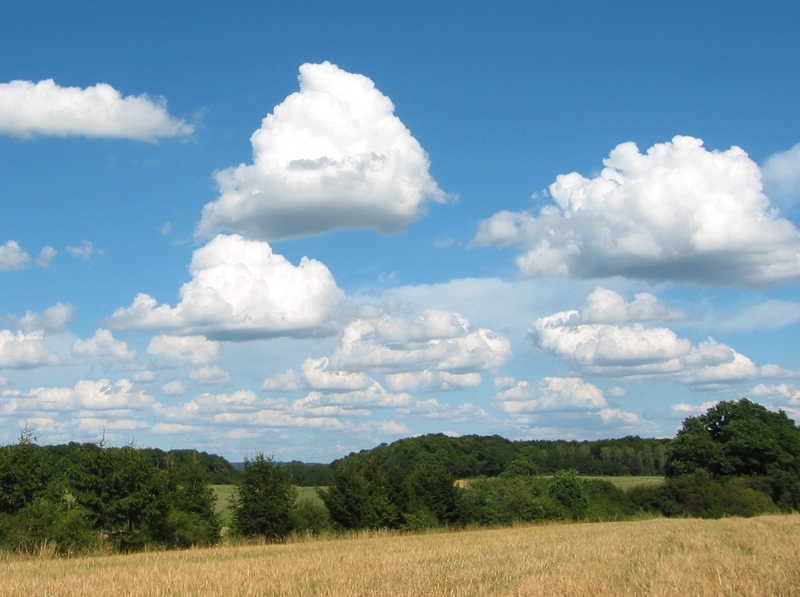 Fair weather cumulus are called cumulus humilis or cumulus fractus (smaller and scattered). As a cumulus cloud continues to grow upwards, it creates cumulus congestus (towering cumulus), and can create rain showers. Latin Derivatives: cumulus - "heap", humilis - "of small size", frangere - "break, fracture" and congerere - "to bring together, to pile up"
Cumulonimbus clouds are created when a cumulus congestus cloud continues to grow higher into the atmosphere. These clouds are enormous, stretching from a low base of nearly 600 m (2000 ft) to 18,000 m (39,000 ft). They can occur alone or as part of a line of clouds. Since there is a high temperature contrast in this cloud (warm temperatures at low levels, cold at higher), a huge amount of energy is contained within a Cb. This variation in temperature creates updrafts within the cloud, which is the process responsible for hail. Any kind of precipitation can fall from a Cb, but the most common weather associated with it is the thunderstorm. 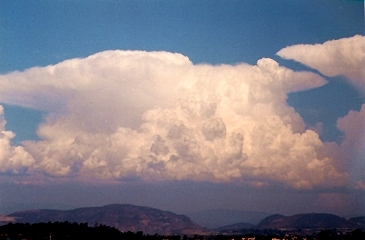 A supercell thunderstorm (see below) begins as a cumulonimbus cloud. Latin Derivatives: cumulus - "heap" and nimbus - "violent rain"